The pressures of an elite Asian society drained Melissa of self-confidence. She deteriorated mentally and became bulimic. Her resurgence was nothing short of astonishing! I was overweight for more than half my life. My insecurities and sense of worthlessness took root as a teenager. I was brought up in an elite all-girls school which was one of the top five in the country. There was a significant amount of stress on my shoulders and my environment was very competitive. 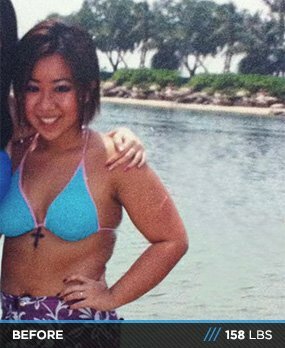 Being overweight in an Asian society where everyone is petite and slim made me feel discriminated against. It was a sin to be overweight in my school. The teachers who led the Trim & Fit (TAF) club were cruel. They often ridiculed the students and put them down in front of everyone. It was emotionally torturing and my self-esteem crumbled. To aggravate matters, a group of seniors enjoyed passing snide remarks about me whenever they saw me. They mocked me mercilessly and used the crudest language. I can still hear the words they spewed from their mouths. On the surface, I seemed jovial and bubbly, but an array of feelings was brewing inside. I was lost in the darkness of my own circumstance. Criticizing echoes left me awake at night as I pondered the meaning of life. I felt worthless, lost, and dejected. I wanted to be accepted. Then, I discovered bulimia. I was obsessed with food and my weight. It controlled my life for years and shattered my self-worth. I was always depressed and miserable. In a way, bulimia paved the way for me to release unhappiness. I went through episodes of binging and purging to let out feelings of anger, depression, stress, or anxiety. I didn&apos;t know who I was anymore. I lost myself physically and emotionally. My weight plummeted by 40 pounds and food became my best friend and worst enemy. The only time I felt in control was when I binged and purged on food. I felt disgusted with myself and hated what I saw in the mirror. Eating disorders are very real. They&apos;re a physical, psychological, and emotional battlefield. It&apos;s tough to explain to someone who never experienced it, but it&apos;s a mental illness. Nobody wants an eating disorder. My heart goes out to people who suffer from them. I can only pray that my story helps or inspires someone to change their life through fitness. The turning point came when I was hospitalized due to the side effects of bulimia. My mother was heartbroken when she saw me lying on the hospital bed with drips attached to my body. I weighed 98 pounds at that time and received lots of love and support from family, friends, and church leaders on my road to recovery. During my road to recovery, I started to pack on the pounds again. This time I was even heavier than before I had bulimia. I was up at 158 pounds. That is a lot of weight for a 5-foot Asian girl. I started getting depressed again because I was at my heaviest ever. I confided in my church leader, who stood by me, and I surrendered to Jesus. I was sick and tired of feeling lousy about myself. I didn&apos;t want to start purging episodes again. I had to make the decision to do things the right way because no one could do that for me. I signed up at a gym and my fitness journey took root from there. When I first started this fitness journey, my fitness level was very bad and I was very conscious about myself. My body fat level was 36 percent. Like all beginners, I experienced all kinds of muscle aches and hated it. I took it one day at a time and made sure I worked out. There were times I wanted to give up. I felt disgusted with myself and cried out to God for strength. My family, especially my mom, was very supportive. As time went by, I started to see results from working out regularly. That drove me to work out even harder. The pounds started dropping and my clothes were hanging from my body. I could breathe easily and felt more confident. Exercising became a habit. It was no longer a chore and I grew to love it. It&apos;s a lifestyle that will always be a priority. My body changed drastically and I packed on lean mass. However, I wasn&apos;t very strict on my diet. I had too many cheat meals which compromised my results. I always dreamed of having a tight muscular body with abs. I started to see great results when I cleaned up my diet and stopped making excuses. There is no way I can ever out train a bad diet. I started cooking and prepping my own meals. I kept a log of what I ate and the amount of food I was feeding my body. Because of my history of binge eating, I tend to overeat. Recording my food in an app on my iPhone helped me keep track calories and made a huge difference. I started to see changes in my body quickly. My body fat lowered, and for the first time in my life I saw my abs. I was ecstatic. All I ever wanted was a flat stomach to replace the three layers of fat I carried all my life. A few years ago, I signed up at Bodybuilding.com and was amazed and highly motivated by the many inspirational individuals there. There were many women with amazing bodies and I was inspired to compete in figure. In December 2011, I entered my first figure competition. I was on the verge of quitting six weeks before because my grandfather passed away suddenly. I knew that wasn&apos;t what he would have wanted for me, and so I carried on with contest prep. It was a really difficult period in my life. Even though I didn&apos;t win, I was really happy I&apos;d come this far. My biggest inspiration, who I found through Bodybuilding,com, is Dana Linn Bailey. I first saw her on BodySpace. Her physique is number one in my book, and I told myself that I wanted to look like that one day. I follow the cyclical ketogenic diet, which means I cycle periods of low carbs, high protein, and high fat with periods of high carbs, high protein, and low fats. I carb load once every four days. I found many helpful articles on CKD on Bodybuilding.com. I also drink about a gallon and a half of water per day. I work out seven days per week with five focused on weight training and two on cardio. I perform 30 minutes of cardio every day after my workout. On non-weight training days, I combine an hour of cardio (stairmaster or elliptical) with an abs routine. My training style is a mix of powerlifting and bodybuilding exercises. I incorporate powerlifting methods to build mass and size. Bodybuilding methods are for conditioning and stimulating more muscle fibers. Sticking to my diet is my biggest challenge. Due to my history with binge eating, I always struggled with food. Over the years, I learned to cope with emotional eating and how to listen to my body. I hope to be able to compete in the physique category one day. I&apos;m giving myself another 3-4 years to build my physique to that level. The fitness journey is full of challenges. There will be days when you fall off the wagon. I fell off so many times during the course of my journey, but I learned that failure isn&apos;t falling. Failure is not getting up and trying again. Things may get really tough along the way, but you will succeed by not throwing in the towel. To be great, sacrifices need to be made. It&apos;s not the load that breaks you down, it&apos;s the way you carry it. At the end of the day, I know that however heavy my load is, Jesus will carry me through it all. Bodybuilding.com is amazing. It&apos;s a great medium to share training/diet tips. The forums are excellent for feedback on products, exercises, and training tips. I love the articles and videos also. They are informative and help me achieve my goals. I found Dana Linn Bailey, my fitness inspiration, through Bodybuilding.com.